All right, I admit it. After reading Marvo's review of the new Brown Sugar Cinnamon Ritz Crackers, I had blogger envy and went on a trip to my local Wally World to try to find them for myself. I didn't find the Brown Sugar Cinnamon variety...but I did find the limited edition Fudge Covered! Yes, people, this review is packing some fudge (oh, come on, you knew at some point in this review my inner twelve-year-old was going to come out). 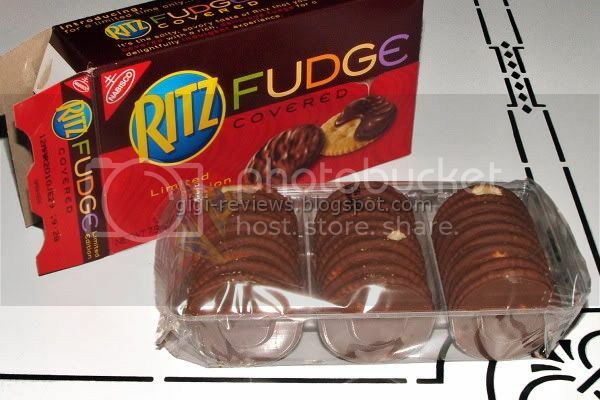 If you think about it, a fudge covered Ritz cracker ought to be pretty darn good. Ritz crackers are buttery and salty -- both tastes that pair quite nicely with chocolate/fudge. I also happen to be a huge fan of chocolate covered matzo, so I thought this might be an extension of that love. According to Marvo, the Brown Sugar Cinnamon version only has the cinnamon and sugar on one side. So that's what I was expecting with this version. As it turned out, the crackers are fully enrobed. The fudge layer is quite thin, granted, but it covers completely. The fudge itself has a very light, milk chocolate color. It is very sweet and only vaguely cocoa flavored. And it's oily, too. (There is a lot of oil in them, so this is no surprise.) Based on the package illustration, I thought it would be a little darker. Actually, I wish it really had been a dark chocolate. I think dark chocolate or darker fudge pair better with savory items. I had had high hopes for the cracker. 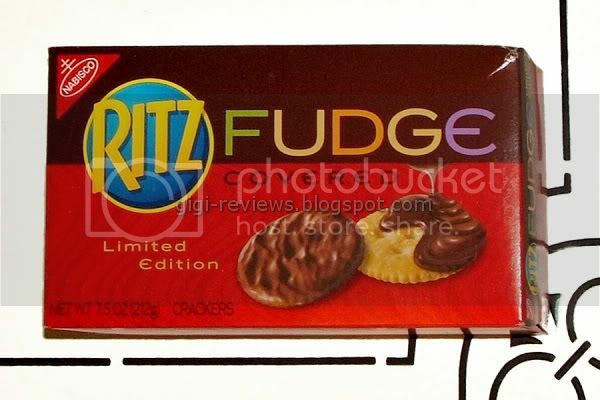 I expected that the rich, buttery, salty crunch of the Ritz cracker would cut through the fudge. Sadly, that never came. And oddly enough, the crackers seemed neither buttery nor salty as one would expect. In fact, it tasted exactly like a Keebler Fudge Stripe cookie. It's not that this is a bad thing per se, particularly if you really love Keebler Fudge Stripes -- it's just that they sucked everything out of it that could have made it distinctive. The crackers aren't even that crunchy, for crying out loud! Makes you wonder what the point of this effort was. Bland, boring, and completely forgettable. I love fudge! And I heart Keebler Fudge Stripes! 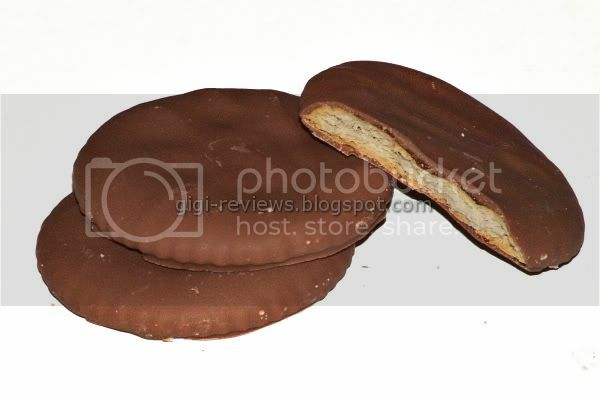 But don't these kinda look like those Girl Scout Thins Mints cookies?. I want those (thin mints). I would have loved the salty buttery chocolatey taste better too...at least we can still make them ourselves by dipping the regular Ritz in chocolate! It's true, you can dip your own Ritz into chocolate and make your own or try this...Make Ritz peanute butter sandwiches and THEN dip them in chocolate! Even Better! I saw these in the grocery store today. I had them in my hand and was salivating. But I thought they would be too good and I'd eat them all in one day so I put them back. Based on your review I'm glad I did put them back. I like A's idea, now that I'll have to try! If this helps, I got my box at Walmart but I had also seen them at Albertson's and Von's markets. But- the bad news is that the product was a limited edition product so it may not be currently available. I haven't personally seen them in stores since around New Years. I also gave the Ritz website a try and they are not currently listed. I was just in Kroger today and they had them on the display shelves @ the end of the aisles. For anyone looking for a box so far I have spotted them at Walmart, Albertsons, Vons and Publix. Also back for the holidays as Stefani pointed out are the fudge covered Oreos (both white and mint). Sadly what I have not seen so far this year has been the candy cane Oreo's. Has anyone spotted them?